Shoreditch Town Hall plays host to our summer show. This year, East London Printmakers will be holding its annual summer show at Shoreditch Town Hall Basement. Over 70 artist printmakers, all using a wide variety of approaches to print, will be exhibiting their latest work. 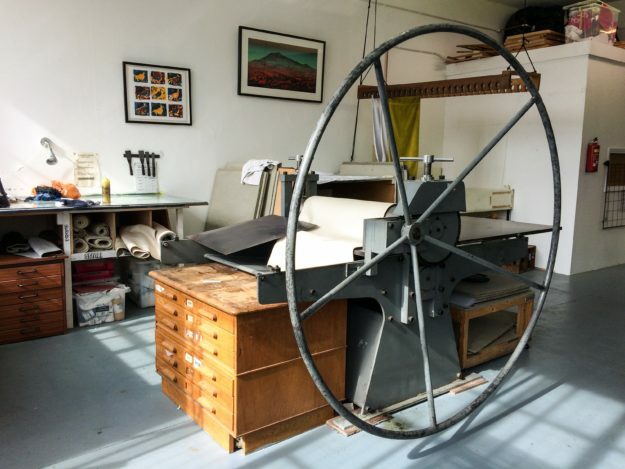 East London Printmakers is an independent collective of artists based in Hackney. Established in 1998, ELP celebrates its 15th anniversary this year. The studio was set up with the aim of providing a printmaking resource to promote the creative potential of practising artists and individuals in the local community. The spacious studio provides open access facilities and courses. It also organises exhibitions and events for the benefit of its members. Recent ELP exhibitions have been held at Forman’s Smokehouse Gallery, the Freud Museum, Space Studios and the V&A Museum of Childhood. The annual Box Set of prints is held in the print collection of the Victoria & Albert Museum. The ELP Box Set of Prints 2012 will be launched at the exhibition. 2014 season of courses now available for bookings. We are thrilled to announce our new course and workshop schedule for 2014, now bookable through our new online booking system. The range of courses is as varied as ever, offering everything from Bookbinding with Katy Goutefangea to Wood Engraving with Chris Pig. You can browse all the Courses & Workshops by clicking here, or by clicking Courses in the menu at the top of the page. From there you can search by date, browse by name, or filter by daytime, evening, beginner, or intermediate. If you would just to like to use the facilities, and can work competently unaided, then why not book one of our Open Access printing sessions on Wednesdays and Saturdays by clicking on Booking in the menu above.